Well, it looks like Terry Rossio & Ted Elliott may be returning to the Disney fold to make the new "The Lone Ranger" movie for Walt Disney Pictures, but their colaborative director on the Pirates trilogy isn't. We've heard that Jerry Bruckheimer was wanting Gore Verbinski to team up with the writers and he for a new adventure in the Wild West. The Trades are reporting that Gore Verbinski has signed on to direct Universal Pictures' big screen adaption of the video game "Bioshock". While I regret not having Gore come back for this film(several top notch directors will obviously now have a chance to fill the slot), I'm excited to see what he and screenwriter John Logan("Gladiator","The Aviator", "The Last Samurai" and "Sweeney Todd") have planned for this adaptation. Having played the game, I can tell you it's a cool trip. Very smart, very visual and totally stylish beyond most games in its genre. It and a couple other titles have tempted me into almost getting a X-Box 360... almost. But the possibility of watching a talented director and equally talented writer teaming up for this could prove interesting. Hmmm. Well, from my POV - unimportant as that may be - I'd be glad if "The Lone Ranger" was left in peace. T&T, while great writers, have a tendency to go a bit (!) overboard when left to their own devices. As for Gore, it doesn't surprise me one bit that he's moved to another part of town to work. From comments he made after the Pirates films were complete, I got the distinct impression that he needed a block of time to recover - Seems that working for the Mouse on these pictures was more grueling than it should have been. I am not a huge fan of what was done to the trilogy in the name of $$$, but I do admit he did a remarkable job creating those films. I expect he will continue to produce his standard quality work in future projects. I didn't expect that Gore would have directed The Lone Ranger, but I hoped that he would be attached to another Disney project as well. Bioshock really is a brilliant piece of software. I think the game could easily be adapted into a theme park attraction or even a small land. The environment is that painstakingly detailed. While there were certainly some liberties taken to make the gameplay fun, Rapture, as they call it, felt like a believable underwater city. I could easily see Bioshock worked into Tokyo DisneySea, if they wanted to. But it's a Universal property I guess so I hope that if the film is ever successful, that they do work it into an attraction, perhaps at Islands of Adventure. While it won't do the visuals justice, I invite anyone to check out the game's intro for themselves on YouTube. The world they've created for this game is a real piece of work, whether you enjoy video games or not. 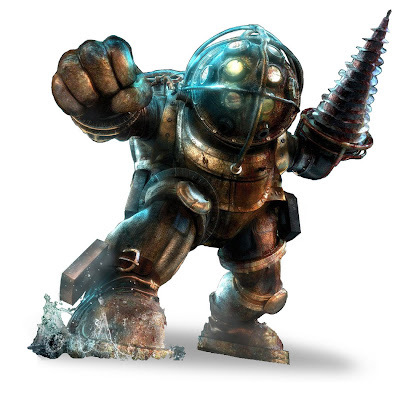 Within the first 10 minutes of playing Bioshock, I was hooked. This game is brilliant. The visuals, the haunting sort of dilapidated 1950's look, it has an environment that is strictly one of a kind. I would also LOVE LOVE LOVE to see this worked into a Theme Park, I could easily see "The City of Rapture", at IOA of like spokker said, at TDS, it would fit perfectly.